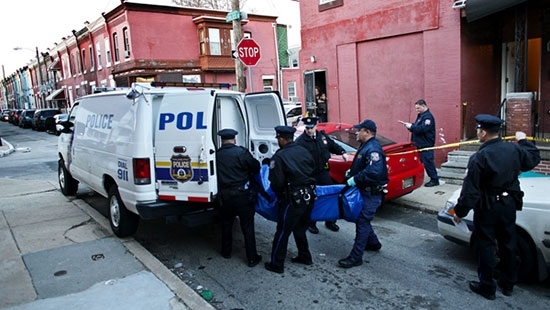 Philadelphia will end the year with the most homicides since 2012. As of Thursday, there have been 314 people killed in the city. That is 13% higher than 2016. There were 331 homicides in 2012. Philadelphia Police Captain Sekou Kinebrew believes that the opioid crisis is to blame for the rise as violence in the neighborhoods where the drugs are sold often leads to killings. However, other violent crime such as shootings, rapes and gun robberies are going down. It is too early to say exactly what is causing the uptick in deaths. The city continues to prepare for Monday's Mummers Parade along Broad Street. Philadelphia Police are ramping up their efforts for the outdoor public event to ensure everyone's safety. Barricades will line the parade route and side streets will be blocked off. Expect to see a lot of uniformed police on the streets. Also, they be monitoring surveillance cams in the Police Real Time Crime Center in South Philadelphia and taking a sky high view from a drone. A decision on whether or not the parade will continue as planned won't be made until Saturday around noon. The frigid temperatures are expected to continue at least through next week. The parade is scheduled to start on Monday at 9 a.m. and temperatures could be in the teens with wind chills around 0. There are concerns for not only the physical well being of the performers and spectators but also the playability of the instruments themselves. There will be warming tents along the route for the performers as they march along Broad Street as well as tents for the police officers etc. January 6th could be a possible rescheduled date but the forecast at this time is practically the same. UPDATE: The Philadelphia Mummers Parade 2018 WILL be held on Monday, Jan 1st, despite extreme cold temperatures. The vote was held Saturday around 1:30 p.m. between the city and mummer division heads. It was 3-2 in favor. Due to the cold, two shore towns have postponed their annual New Years Day polar bear plunges into the Atlantic Ocean. Margate canceled the plunge but will still hold the party. The rescheduled plunge is for January 7th. Brigantine has rescheduled for January 13th.